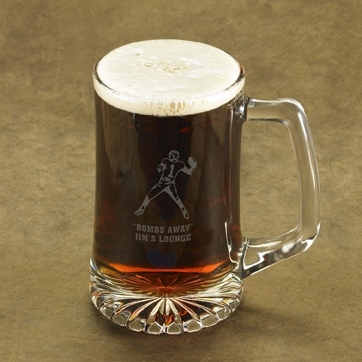 * Drink a toast to your favorite pastime with our sturdy 25 ounce personalized Iconic Sports Mug. * These gracefully shaped glass mugs are laser-etched and hold a hefty helping of your favorite brew and make an attractive addition to your home bar. * Buy one or a whole set for you and the gang! * Choose one of our detailed images and add your own creative personalization. * Holds up to 25 oz. 6.75" x 3.75" x 2"